Add this product to your routine if you have any signs of constipation. 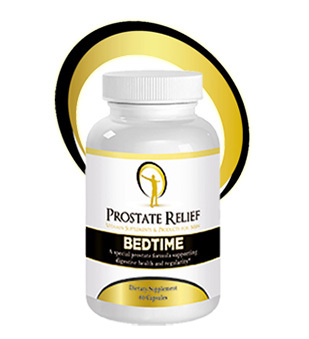 Prostate Relief “BEDTIME” is specifically targeted to those with occasional constipation, hemorrhoids, colitis, frequent gas, or any symptoms of Irritable Bowel Syndrome, all of which have an impact on your prostate. The special formula is not addictive and will get your colon back on track. You will begin to experience predictable elimination each morning and over time you will clean out your colon and create a healthy environment where gas, constipation and even hemorrhoids will ease or even disappear. Inflammation will be reduced or even eliminated and the affects – your formerly malfunctioning colon had on your prostate – will be gone. Order this product with either The Full Trilogy or Early Response to keep your colon healthy No shipping charges if ordered with any other product.